I’m looking forward to taking part in a challenge swap that Kirppu from Kotikemistin pieni paja organized. She challenged each of us to send one of our favorite soaps and then also to send a soap using a new technique or ingredient that we had never tried before. 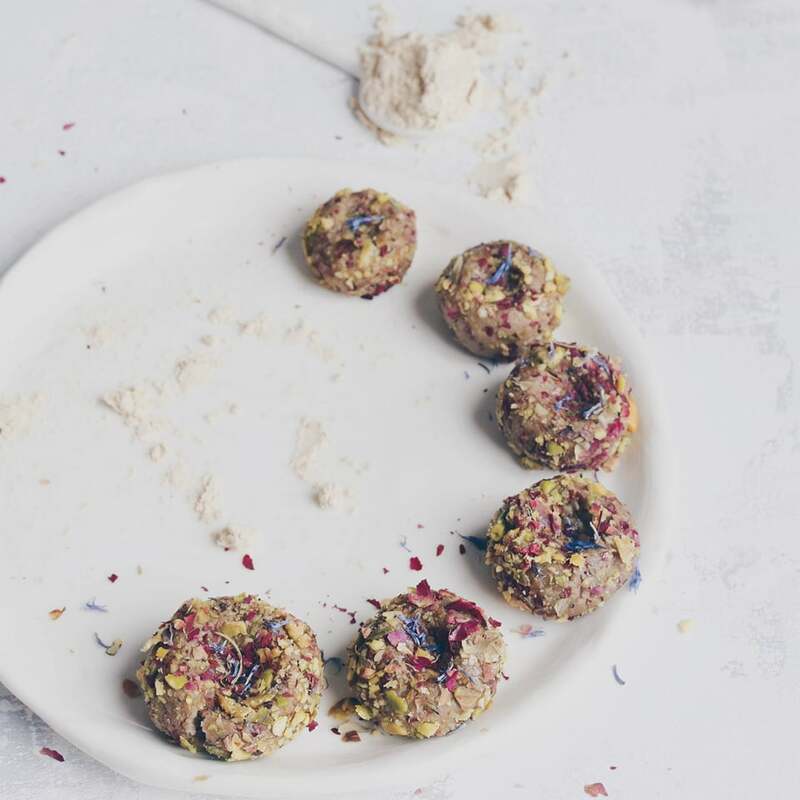 Just after I signed up, I received a recipe for sunflower soap from one of my favorite suppliers in an email newsletter....a sign perhaps?! 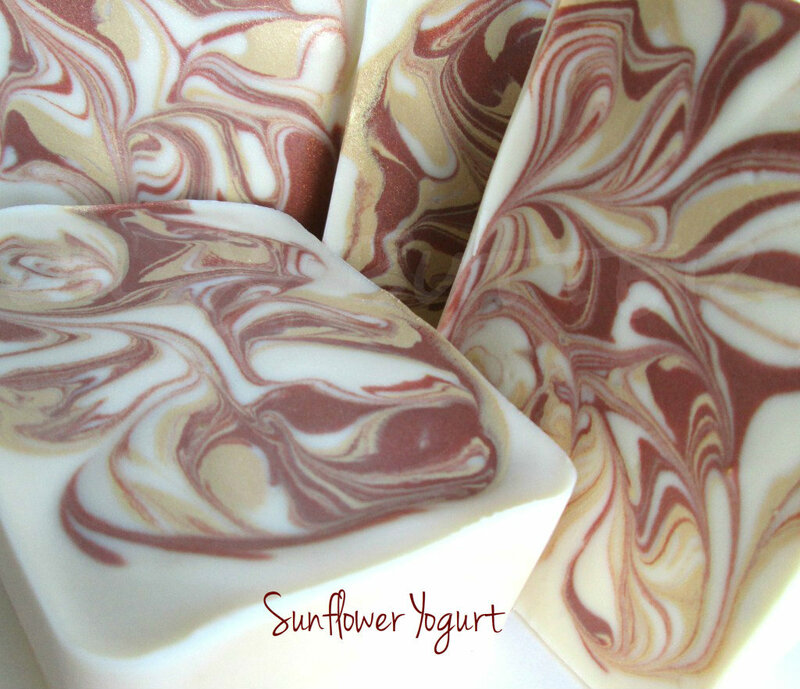 I have never made a soap with sunflower oil instead of olive oil; this soap recipe calls for just sunflower, coconut and palm oils. I’ve also been meaning to try yogurt in soap for a while too, so I substituted yogurt for the liquid portion of the soap. The yogurt turned BRIGHT reddish-orange as I was adding the lye, even though I had frozen it into cubes and was adding the lye very slowly. I ended up adding t.d. to my base oils to counteract the reddish-orange color of the yogurt. The gold and copper micas both stayed shimmery, yay! This soap took much longer than my usual recipes to bring to trace, I'm not sure if that is because of the sunflower oil? I thought the yogurt would accelerate trace, as my milk soaps tend to do, but the soap stayed at thin trace for quite a while. This would be a great recipe for fancy swirling techniques. Wow!! Love those colors and swirls. I had the same problem with yogurt, but it turned pale orange and the soap went darker as it cured. I have mostly used sunflower oil in shampoo bars, because I think it makes my hair cleaner. Thanks Kirppu! It has already turned a darker yellow color, so it will be interesting to see if it gets any darker. Oh my gosh, those swirls are gorgeous! I am anxious to hear how you like the soap. I've never used yogurt of sunflower either. Thank you Laura! I don't usually do those kind of swirls as my soap typically sets up so fast, so it was nice to have the time to play with it. WOW lovely swirls and luxery ingredients!!! stunning, Cee Gee! :) yogurt makes for a lovely soap..and mine went darker too (as Kirppu's did) as it cured. I've never used sunflower oil in soap before, but would like to try it someday. Thanks so much Kalla! That's interesting about the yogurt, it's a perfect dark yellow color right now, so I'm hoping it doesn't change too much more! I'm looking forward to seeing what the sunflower oil adds to the soap. The swirl is amazing,Cee! Really perfect! 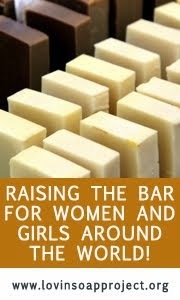 I don't know who is your partner in this swap but I am sure she will be delighted receiving this beautiful soap :). I love yogurt in soaps, it makes soap so rich and creamy! Aw, thanks so much Natalia! I'm looking forward to trying it, it's so hard to wait! Post some pictures during the cure period, so we can see how dark it's gone! I think you're right about sunflower oil, I've used the cold pressed one and it seems to take longer to bring to trace. But,I've never substituted the whole amount of o.o., I've gone with 50% max. That makes your soap more interesting, I wonder if it will make any difference. What do you think about sunflower oil going rancid? Some sources say it doesn't go,due to high vit.E percentage,others claims it goes rancid faster than other oils. That's a great idea Maja, I will post some pics as it's curing to see how it changes. I have heard the same about sunflower oil going rancid, so I used freshly opened sunflower oil and I'm hoping that will help. Some people add rosemary oil extract to their rancid-prone oils to extend the shelf life, but I have never done that. I just usually try to use those oils up quickly and keep them in the fridge between uses. This soap is actually about 41% sunflower, 28% palm and 31% coconut. I've never used that high an amount of coconut either (which I've heard can be drying in high amounts), so it will be interesting to see how this soap feels. I'm so glad you shared that Kalla, thanks! I didn't notice the CO amount when I was making it, so I only used a 6% SF for this, which is probably okay because of the yogurt. However if I still find this drying, I will definitely take your advice and up the SF. I'd love to try making an 80% CO soap, what SF would you recommend for that? Oh wow, that looks fantastic Kalla, thanks for posting this! Can't wait to see what you think of the 100% CO! This is definitely one of the most beautiful swirls I have ever seen! I love using the golds that keep their shimmer too. So pretty! What a great swirl! 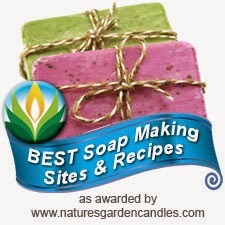 Your soaps are always inspiring! Hey Cee,if it was super thin,how did you manage to pour the colours without having them sunk thru the white part? Hi Maja! I just drizzled on the colors lightly, from not very far above the soap, and then used a wooden stir stick to swirl the top. If you pour the colors from too high, they will sink (which is also a cool effect, and how I did the colors in my blackberries & cream soap). Hope that helps! Yes indeed, I like that 'droplet' technique and it seems to be easier to do than make colours staying on the top,when batter is thin. Anyway,both are great! Today, I have this soap. My english not good, but I say you thank you very much. This soaps are very lovely, thanks. Did you know you can shorten your long links with AdFly and get dollars from every click on your short links.